Ideal Weight calc pop determines how much weight you need to lose or gain to reach your ideal weight. IWC calculates BMI and compares that to a daily protein range to reach your weight goal. Ideal weight loss pprograms are recommended according to your protein range. Find out 'What You Should Weigh!' And what to do about it. Close Men you must select your gender. Women are pre-selected. Incorrect choice will skew results and may cause undue anxiety. Close Height enter the number of feet tall you are. Enter remaining inches in next field. Close Frame Frame size is determined by elbow width. See chart fo determing frame size. 4'10" to 5'3" 2-1/4" to 2-1/2"
5'4" to 6'0" 2-3/8" to 2-5/8"
5'2" to 5'7" 2-1/2" to 2-7/8"
5'8" to 6'3" 2-3/4" to 3-1/8"
Sizes below those shown are 'Small" frame. Sizes above those shown are "Large" frame. Fat production is a direct result of low energy levels. So, it makes sense that boosting energy will require more protein. When the body gets the right amount of protein it will reduces the need for storing energy and start burning fat as fuel. Weight loss comes from burning fat as energy. Boosting the amount of energy one produces leads to burning fat. Hense added protein plus energy boosters are a safe, healthy way to lose weight. Protein Range A 70-99g of protein daily. This should burn 10 to 16 pounds of fat at a rate of 3-5 pounds per week. A weight loss plan of 4 to 6 weeks is needed. Recommend Herbalife Quickstart Program. Protein Range B 100-124g of protein daily. This should burn between 16-30 pounds of fat at a rate of 3-5 pounds per week. A weight loss plan of 6-10 weeks is needed. Recommend Herbalife Advanced weight loss program. Protein Range C 125-149g of protein daily. This should burn 31-45 pounds of fat at a rate of 3-5 pounds per week. A weight loss plan of 10 to 15 weeks is needed. 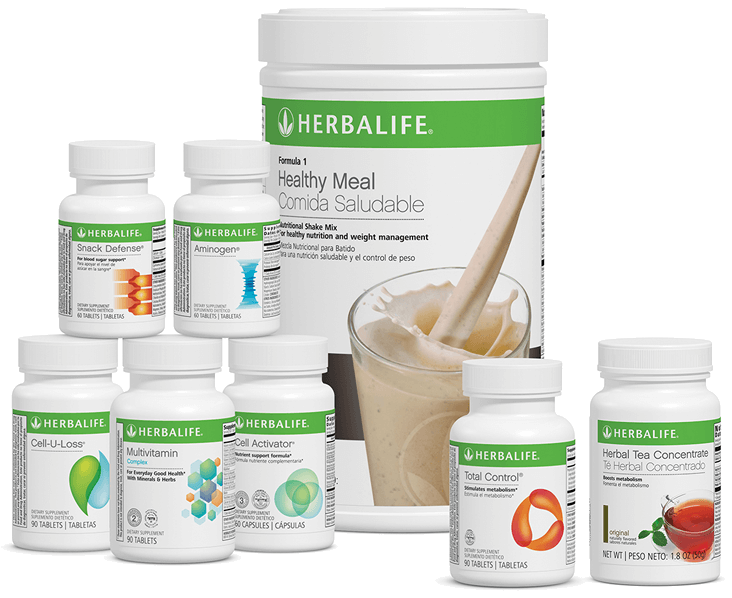 Recommend Herbalife Advanced weight loss plan. Multiple refills may be required to reach ideal weight. Protein Range D 150-175g of protein daily. This should burn between 46-60 pounds of fat at a rate of 3-5 pounds per week. A weight loss plan of 15 to 2o weeks is needed. Recommend Herbalife Ultimate weight loss plan. Multiple refills may be required to reach ideal weight. For more than 60 pounds of weight loss continue weight loss plan until ideal weight is reached. I would love to sell you the Herbalife Weight Loss Programs, but that is not permitted on this website. To do so would jepordize my distributorship. Instead you must contact me and inquire personally about our products. See form below. Here are the weight loss programs details. Quickstart Weight Loss Program - features Formula 1 Nutritional Shake Mix (21.7oz./616g). Herbale Tea Concentrate HTC (1.8oz), Formula 2 Multivitamin Complex (60 tablets) Formula 3 Cell Activator (60 capsules). Advanced Weight Loss Plan features QuickStart plus Cell-U-Loss (90 tablet) and Total Control (90 tablets). Ultimate Weight Loss Program - features Advanced Program plus Snack Defense (60 tablets) and Aminogen (60 tablets). Usage, dosage and detailed instructions are available with your inquiry.